When cherry season rolls around again next year, I know the first thing we’ll make. Pork chops. We first made this dish with fresh cherries right at the end of the season. It was pretty darn fantastic. And when cherries quickly disappeared from the shelves, we switched to another fruit that performs equally well in savory dishes: blackberries. The dish is pretty simple: you sear the pork chops, make the sauce, and then simmer the pork chops in the sauce to finish cooking. The sauce is slightly sweet from the berries and port and the leeks give it some body. We serve the pork chops over plain couscous – it’s a 5-minute, no-fuss side dish and it soaks up the extra sauce. We use our homebrew port but Six Grapes, Warres Warrior, and Messina Hof Papa Paulo are good options if you don’t already have a favorite. If you prefer not to use the alcohol, consider thinning 2-3 tablespoons of blackberry preserves with a little chicken stock and using that instead. The pork chops we usually cook with are thinner and probably aren’t as nice as most recipes call for. But they’re far more budget-friendly and, by brining them, we can easily level the playing field. The beauty of brining is that you can use a pricier, super thick, center-cut pork chop or a thinner, super value pork chop. And the end result is still a tender, juicy pork chop. 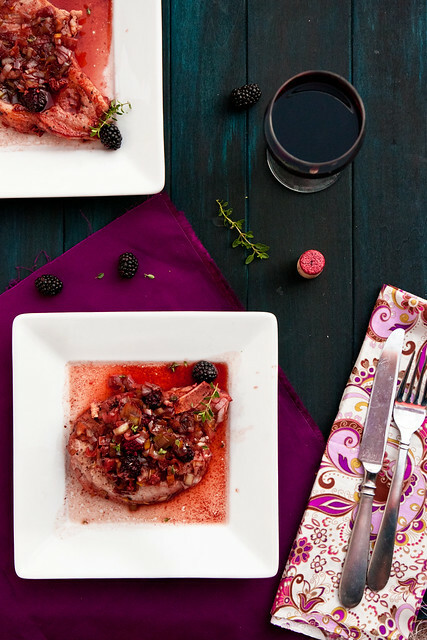 Brined pork chops served with a blackberry-port sauce. During cherry season, substitute fresh cherries for blackberries. Remove the pork chops from the brine, pat dry, and season with black pepper. Heat olive oil in a large pan over high heat and sear the pork chops 3-4 minutes on each side, until nicely browned. Transfer the pork chops to a plate and set aside. Reduce heat to medium and add butter and leeks, sauteing until softened and beginning to brown. Strip the leaves from the thyme springs and add to the pan. Stir in the broth and cook, stirring to scrape up the browned bits from the pan bottom, for 1 minute. Reduce the heat to medium low, add wine, vinegar and blackberries (or preserves, if using), and let simmer 5 minutes. Return the pork chops and any juices from the plate to the pan and spoon the liquid over the chops. Cover and simmer until the pork is tender and barely pink in the center, about 10 minutes. Divide among 4 plates, spoon the sauce over top of pork chops and rice or couscous, and serve immediately. I do the same thing–lower quality pork chops + brining = huge upgrade. Brining makes everything better! You know what I think would also be awesome in this now that fall is here? Cranberries! Sounds like the perfect sauce for that pork! Oh my goodness. 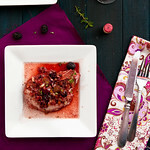 Pork chops plus fruit makes some of my favorite dishes ever. This sounds wonderful! I have some frozen cherries, I may try using them. thanks much for sharing. Wow, Shawnda, what a lovely combination of flavors you used in this recipe! This is something I’d definitely like to try sometime soon. Thank you for sharing your recipe and gorgeous photo!